The letter was published in the Times newspaper this morning. Signatories include actors Robert Reford, Robert de Niro and Colin Firth, musician Sting, artist Damien Hirst, British opposition leader Ed Miliband and former French foreign minister Bernard Kouchner. 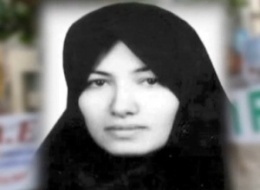 They call on Iran’s Supreme Leader Ayatollah Ali Khamenei and President Mahmoud Ahmadinejad to release Sakineh, along with her son and lawyer, who are also imprisoned. It reads: “Sakineh Mohammadi Ashtiani has suffered enough. “Forced by international pressure to suspend her execution by stoning for alleged adultery, the Iranian government is now attempting to resurrect the charge that she murdered her husband – a charge for which she has already been tried. “She has already spent five years in prison, and suffered 99 lashes, while the man who was convicted of her husband’s murder, and with whom she allegedly had an affair, is now free, having been pardoned by Ms Ashtiani’s children. The letter follows a broadcast in Iran last week of a confession and reconstruction of the alleged crime featuring Ms Ashtiani. Seen as an effort by the government to deflect international criticism over the case, Friday’s broadcast was denounced as “coerced” by human rights campaigners. Read the full article by the Press Association.